The replacement for the Z-45 was another basically second generation gun, with a simple tubular receiver operating an open-bolt, straight-blowback mechanism. But there were a number of improvements to the ergonomics, to making the whole weapon more compact, and of course to manufacturing simplicity. Overall this is an entirely different gun, which was so good it is still in service with some units of the Spanish armed forces at least as late as 2016. 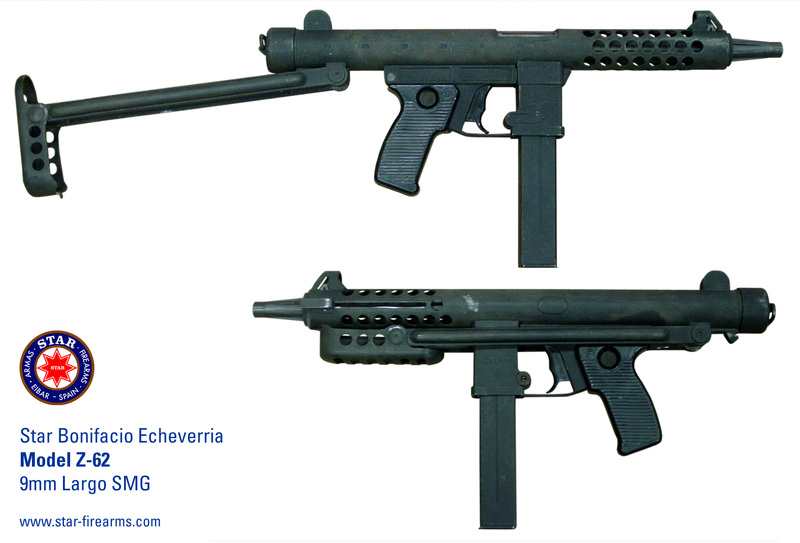 Z-62 â€” The original issued SMG in 9 mm Largo, replacing the Z-45 one for one in Spanish service. Z-63 â€” A prototype of the Z62 in 9 mm Luger/Parabellum to plan for the integration of Spain with NATO standards. Z-70 â€” The production designation for the 9 mm Luger/Parabellum version of the Z62. Z-70/B â€” A general product improvement, with the same overall mechanical layout, but in an entirely redesigned package. Most notably the magazine release, stock, and trigger changed radically. It does not appear that Z-70s were ever reworked Z-62s, but it could simply be that the Star factory did such a good job of the rework that there is no evidence such as overstamped labels. Experienced gained from Spanish Army service with the Z-45 resulted in Star creating an improved, but still 2nd generation SMG in the late 1950s. This entered service in 1963, as the Z62 in 9 mm Largo. A model for commercial sales only in 9 mm Parabellum is known as the Z63. In Spanish Army service, Z62s largely supplanted Z45s one for one. It was replaced in service in the early 1970s by the mostly similar Z-70/B, below. The Z-62 is much more compact than the Z-45, largely due to a different layout, where the pistol grip is much closer to the magazine well. The overall tube length, and bolt travel are approximately the same. The buttstock rotates about a point near the pistol grip, so overlaps the rear of the tube as well. An unloaded weapon weighs 2.65kg (5.84 lbs). The weapon is made entirely of steel, except for plastic grip panels. Many components are machined, with stampings for the stock, tube, trigger assemblies and other exterior components only. 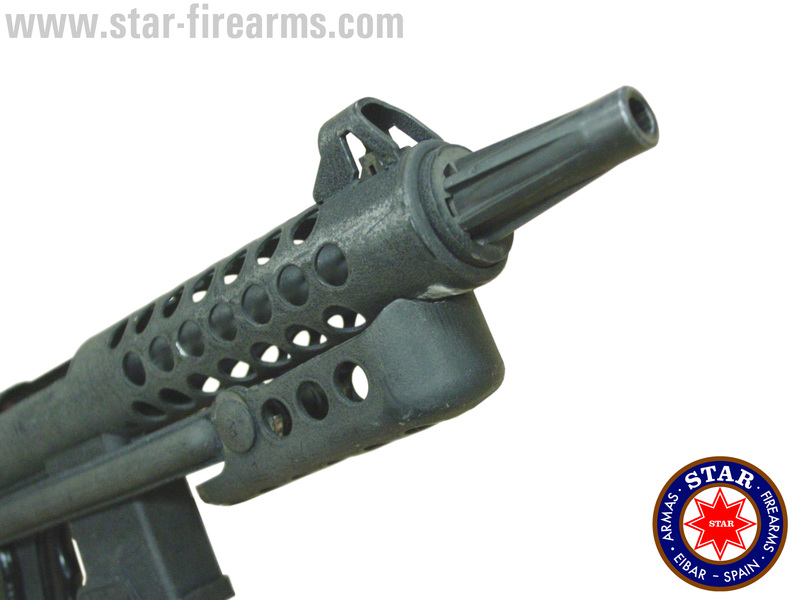 The barrel is 20 cm long (7.85") and it can fit 20, 30 or 40-round magazines. Magazines are ejected by pressing a button at the front of the trigger guard from right to left (as on the M-16). The rear sight is a flipover L type within protected wings, with aperatures regulated at 100 and 200 m.
The Z-62 and 63 achieve fire-selection through a somewhat unique two-finger "selecting trigger." Pulling the bottom notch rotates the trigger and fires the gun in fully-automatic mode; pulling the top notch slides the trigger to the rear and fires in semi-automatic mode. Rate of fire in fully-automatic mode is about 550 spm. This is apparently a Spanish Army requirement, as all subsequent Star models have the same rate of fire. The safety is a cross-button in the top, middle of the pistol grip. These weapons all fire from the open bolt position, but do not have a fixed firing pin. I am unclear as to how exactly this operates. If you are a real fan of Star SMGs, download this very large image of the muzzle of a Z62 which I have cut out, and stuck a Star logo on. Use it for your desktop, or just stare at it. Thanks to reader Jason Hutchins for the photography of his SMG. All Star firearms marked 9 mm / 38 are designed to fire .38 ACP and 9 mm Largo ammunition, but NEVER .38 Super. Read more detail on ammunition for older firearms. The Z-70 is still in use with second-line troops of all sorts, across Spain. It is especially commonly seen in use by the Navy, by shipboard protection forces, as those seen below. I will note that the finish of these guns seems to be perhaps the best ever made. 30-40 year old guns, expecially those in service aboard ships, should not be in such good condition. 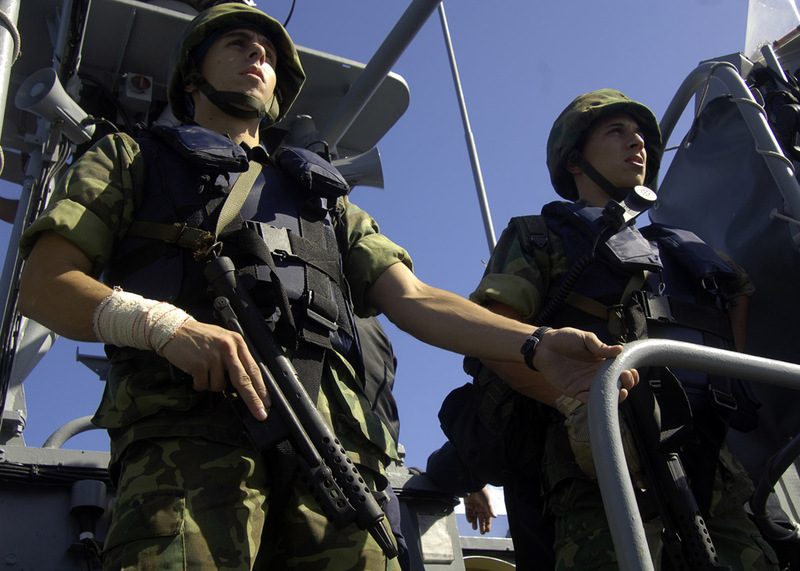 Spanish Marines have all upgraded to the Z-84, or use .223 carbines instead. The Z-70s are basically product improved versions of the Z-62/63 SMG. There are no serious changes to the overall function or method of construction and the guns are the same size and weight. The 40 round magazine was apparently discontinued for this weapon. Z-70s are only made in 9 mm Parabellum. This marked Spain's alignment with NATO, and their general move from Largo to Parabellum across the forces. The other major change was to the trigger assembly. The Z-70s have a conventional, single point rotating trigger. Fire selection is achieved via a rotating lever on the left side of the pistol grip, where it may be actuated with the firing thumb. This lever also incorporates a safety setting. The magazine release has been changed to a lever type, below the trigger guard. A number of other small changes in the overall design were also made. None of these affect general use, and are presumably either to improve performance, longevity or reduce manufacturing costs. These changes seem to indicate that most parts are not interchangable between the two series, despite their optward similarity. 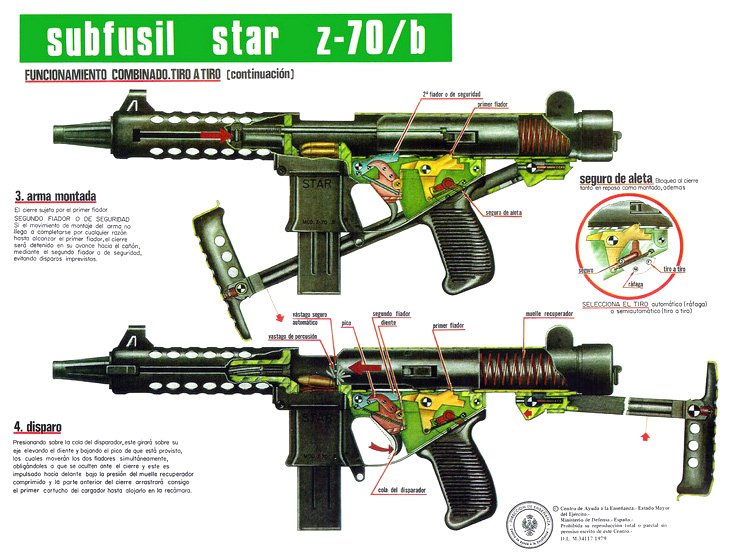 I believe that the Z-70 was the commercial and development model, and the Z-70/B incorporated some trivial changes for Army service, but I do not know what the difference between the two weapons is. For an additional view of the Z70B, see the photo at the top of this page. It is not clear the /B variants were adopted, or at least adopted in quantity, by the Spanish armed forces. I have seen much information about them, even in the popular Spanish arms press of the time, but no photos of Spanish soldiers, sailors or Marines carrying this version. 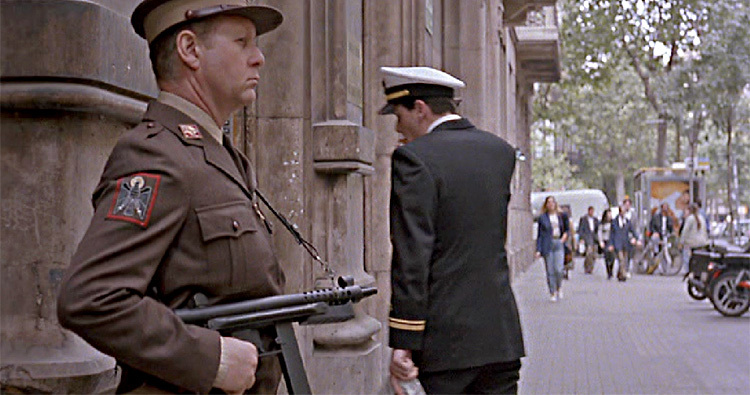 The Z-70 are still in use with second-line troops of all sorts, across Spain. It is especially commonly seen in use by the Navy, by shipboard protection forces, as those seen below. I will note that the finish of these guns seems to be perhaps the best ever made. 30-40 year old guns, expecially those in service aboard ships, should not be in such good condition. 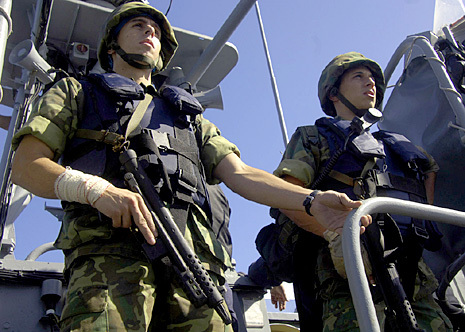 Spanish Marines have all upgraded to the Z-84, or use .223 carbines instead.